Like all of us, Peter Julian Eymard [pronounced A-mar] was conditioned by his cultural background as well as by the sociopolitical milieu of his time. Life in France during the first half of the nineteenth century forms the backdrop against which to view the gradual unfolding of Peter Julian’s life story. Years earlier, the French Revolution of 1789 had radically altered the political, legal, social and religious structures of the country. As a teenager, the industrial revolution was changing the face of Europe. As a young man Eymard witnessed the dawning of the Age of Romanticism in art, music, and literature.Peter Julian Eymard’s road to the priesthood, as well as his life as a priest, was marked by the cross. In French society, there was a strong anticlericalism. In addition, the Eymard family was poor and Peter Julian’s father was reluctant to give his blessing to his son’s choice of career. His first attempt to attain priesthood ended because of serious illness. He tried again. 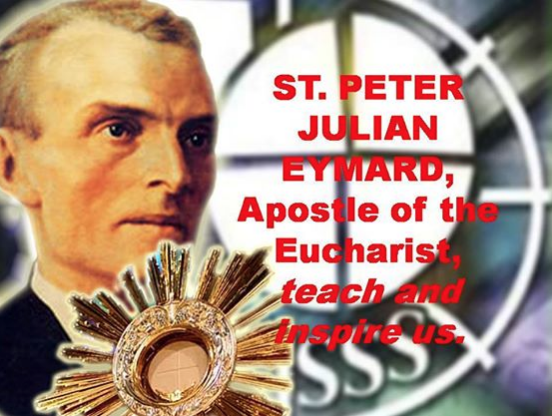 On July 20, 1834, at 23 years of age, Eymard was ordained a priest for the Diocese of Grenoble.In Eymard’s day there was a religious movement called Jansenism. This movement focused on the gravity of human sinfulness and as a consequence stressed our unworthiness in the presence of a transcendent and perfect Divinity. In his early years as a seminarian and priest, Fr. Eymard was influenced by this reparation spirituality and he would struggle his whole life long to seek that inner perfection that would enable him to offer to God the gift of his entire self.Perhaps it was the intensification of this growing spiritual struggle along with Fr. Eymard’s desire to accomplish great things for God that led him to enter religious life. On August 20, 1839, Fr. Eymard became a member of the Marist Congregation by professing the vows of poverty, chastity, and obedience. All his life Peter Julian had an intense devotion to Mary, the Mother of God. He knew about the apparition of Our Lady at La Salette and enjoyed traveling to various Marian shrines [throughout France]. It was Eymard’s apostolic work for the Society of Mary that put him in contact with the various currents of eucharistic piety that were flowing in the French Church.Peter Julian, despite his poor physical health, was an unusually energetic and hardworking priest/religious. There was always an enduring desire to enter into contemplation; but with his work, travel, writing, preaching, spiritual direction, and responsibilities as Marist provincial [superior], there was neither the environment nor the time for this desire to be fulfilled very frequently.What did Fr. Eymard do as a Marist? He was an outstanding organizer of lay societies, a zealous educator, a well-prepared preacher, and a bit of a prophet to his fellow priests and even to his religious superiors. Fr. Eymard was quite successful at preaching eucharistic devotions, such as the Forty Hours.He asked his Superior General, Fr. Jean-Claude Colin, for permission to write a eucharistic rule for the Third Order of Mary of which, he, Peter Julian, was the director. Fr. Colin said no. Nevertheless, the idea for such a rule had already been written in the mind and heart of Fr. Eymard. Founding the Congregation of the Blessed Sacrament was not an easy task for Fr. Eymard. In fact, responding to God’s Spirit as a founder involved him in relational conflicts, personally embarrassing situations, financial troubles, and physical exhaustion. His first hurdle was getting the founding of the Congregation approved by several local bishops. When this approval came, Fr. Eymard opened his first community on Rue d’Enfer in Paris.The work of preparation for First Communion, especially among adults, was the aspect of the new eucharistic venture that had interested the archbishop of Paris and for which he had granted his approbation to the new group founded by Eymard. Other eucharistic communities and organizations were springing up throughout France but Archbishop Sibour rightly perceived that Eymard’s intuition about the Eucharist was not limited merely to the worship of the holy sacrament but to actively reach out to those who were estranged from the church and to evangelize them. Father Eymard directed his ministry firstly to the children and young workers that made up a large segment of the labor force of Paris. As early as 1845, Eymard began to move away from a spirituality of reparation toward a spirituality of Christ-centered love. Three years prior to his death, Fr. Eymard made a long retreat in Rome. During this retreat, he was powerfully struck by the force of Christ’s love within him – a love he felt taking over his whole person.